Red cabbage with sausage and pork. Photo courtesy Foods And Wines From Spain. 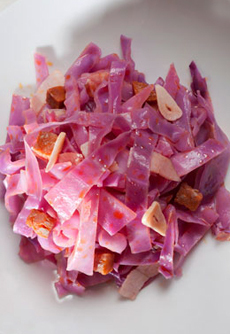 This red cabbage dish is a Christmas specialty in Spain, where it is called Lombarda navideña. To make it festive, sausage and bacon are added. All over Europe, red cabbage is a delicious pairing with duck, goose, ham and pork roast. This recipe has Spanish touches of chorizo, Spanish olive oil and sherry vinegar. Daisy Martinez, who cooks Puerto Rican style, makes a Lombarda navideña with more layers of flavor, including brandy, lemon, pears and raisins, plus bay leaf and thyme. Here’s her recipe. We adapted the recipe below to include the thyme. Foods and wines From Spain recommends enjoying it with a dry Cava, Spain’s famed sparkling wine. It’s one of the few wines that can be matched with red cabbage, they say. 1. FINELY CHOP the cabbage and wash it thoroughly. Add it to a pan full of boiling water and cook until it becomes soft. Drain the cabbage and place it in a saucepan. 2. HEAT the olive oil in a frying pan and cook the garlic briefly. Add this mixture to the red cabbage followed, by the chorizo and the bacon. Cook over a low heat for 15 minutes. 3. ADD the vinegar and thyme, plus salt and pepper to taste. Stir and cook for a further 5 minutes. Adjust seasoning as necessary before serving. This recipe was adapted from the original by Sonia Fuentes/©ICEX. Find more delicious recipes at FoodsWinesFromSpain.com.